Debut author Karen Healey introduces a savvy and spirited heroine with a strong, fresh voice. Full of deliciously creepy details, this unique, incredible adventure is a deftly crafted story of Māori mythology, romance, betrayal, and war. Whoa, I loved this book. I know I use this phrase a lot, but it really was such a refreshingly different novel - you rarely read YA novels set in New Zealand, and even rarer still, read YA novels based on incredibly fascinating Māori mythology with a funny, obnoxious, original and all-around kick-arse awesome heroine. The New Zealand setting was a strong element of the novel, which I really loved. Though it got to a slow start, once the action started and things began to be explained, Guardian of the Dead was fantastic. The baddies were freak-me-out scary, and once I was halfway into the novel I couldn't stop. I think to a degree I found that I wanted more depth to the characters - the plot was sensational, but I felt maybe the character development was a little underdone. I wanted to know more about Ellie and her life before coming to the boarding school, more about Kevin, Iris, everyone. Not just how they were part of the mythological goings-on, but who they really were. This isn't a book that'll appeal to everyone's tastes - while there is a romance element, it isn't huge, and if you like your YA heroines passive and inoffensive then you sure won't like Ellie. But if you're looking for something that's just a bit different, filled with totally unique mythology (and by 'unique' I don't mean 'sparkly') and that is - in parts - downright creepy, you'd be very wise to pick up Guardian Of The Dead when it's released this April. Steph: Can you tell me a bit about the process of writing GUARDIAN OF THE DEAD? Did you start with the storyline, or with the mythology? Karen: Oh, the mythology came first. I'm not sure how it would even work the other way around – plan a plot and then look for a handy mythology to plug into it? That sounds a bit suss. So, yes, I was living in Japan, and really homesick, and I started thinking about Māori mythology, the first stories of my homeland, New Zealand. I thought about the way the legends write the land, and the way the stories we know metaphorically write our individual versions of reality, and I wondered what would happen if someone vaguely familiar with the stories, but essentially ignorant, discovered they literally acted upon reality. How would she cope? What if all stories could be true? How would that work in a young land of immigrants, where many stories exist, but some are considered more important than others? In lots of ways, it's a book that's sort of wrestling with the imagined realities of post-colonial New Zealand. Which is academese for, "The myths came first". Steph: Are there any characters that are really similar to yourself, or events in the novel that are based on your real life experience? Or was all of the inspiration for the novel drawn from Maori legend? Karen: Mostly I did what we lying liars writers do and made stuff up. Ellie has some of my traits, but she's definitely not me, and neither is anyone else in the novel. However, while the Māori mythology is the strongest influence on my making stuff up, I drew inspiration from lots of places; Shakespeare, Greek mythology, New Zealand history. A lot of the drama production scenes were inspired by my real life experience in the happy chaos of high school and university drama - but none of the characters are people I know, either! The part furthest from my experience were the fight scenes, since I can barely throw a punch. Naturally, I decided the narrator would have a black belt in Tae Kwon Do. Good going, me! Fortunately, my best friend runs a martial arts school and she painstakingly explained how to break a wrist grip and perform a perfect side kick. Steph: Can you tell me a bit about your journey to publication? Looking for an agent, going out on submission to editors, getting a book deal, editing, etc? 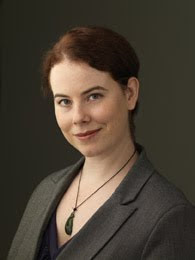 Karen: In 2007, I attended feminist sci-fi and fantasy convention WisCon in the USA, and took part in a writing workshop run by Holly Black. She liked the first three chapters we looked at, and advised me to submit to her agent when I finished the manuscript. Barry Goldblatt was at the top of my agent list. After a lot of really first class panic, I did submit, and he called me. About halfway through the conversation I realised he was actually going to represent me, and I don't remember a thing after that. Editor submission was nervewracking, and I got my fair share of rejections, but I think I could not have landed better editors. I'm really happy with Little, Brown and Allen and Unwin. The actual editing part was great. To me, the blank page is the enemy, and dragging words out to fill it is the hardest part of writing. Once I have something to work with, be it never so crappy, I have a great time picking out themes and rearranging scenes and putting all the pieces back together. I had wonderful guidance from my first readers to the proofreaders, and it really made the book so much better. Steph: Why and when did you start writing? Is GUARDIAN OF THE DEAD the first novel you've written? Karen: I've been lying lies telling fiction since I could talk, and writing it down since I could write. I wasn't dedicated the way a lot of writers seem to have been as kids – I wrote short stories, but I don't have a trunk filled with notebook novels or anything. But GUARDIAN is not my first-written novel – I wrote a couple of solo and very bad novels, and then co-wrote another couple of much better ones with my best friend, Robyn. I learned a lot about plot and structure and character establishment from that. I could not have written GUARDIAN without getting the crappy ones done, so I'm really rather fond of them, even though I never want to actually read them again. Steph: Imaging you can travel back in time to meet yourself as a younger writer without tearing the universe apart, what advice would you give her about writing and life? Karen: Dear self, don't worry about that stuff about keeping a notebook with you at all times and writing everything down in it! In the future you will never be anywhere without a book and a pen, and if you need to note anything, you can do so in the title pages. It will also make re-reading fun. Also, read more. I know you read a lot, but read more. And learn to cook earlier. I promise you'll like it. Steph: What are you working on at the moment? Can you tell me a bit about it? Karen: My next book to be published is currently titled SUMMERTON. It's set in a small, eerily perfect town on New Zealand's beautiful, isolated West Coast, where three teenagers are trying to find the real causes of their elder brothers' supposed suicides. It's a little bit psychological thriller, a little bit paranormal, a little bit romance, and a lot of mystery and action. I'm really excited about it! What I'm currently working on is a secret. I'll just say that every time I sit down and write, I get really, really hungry. I'm going to guess she's writing a cookbook for vampires. 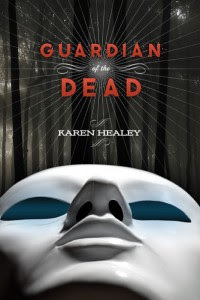 Anyway, while you're waiting for GUARDIAN OF THE DEAD to be released, you should check out Karen Healey's ridiculously funny/smart blog: http://karenhealey.livejournal.com/ and her website: http://karenhealey.com/.